The Freckled Hawkfish is a predatory bottom-dweller. It likes to perch on top of rocks or coral heads, just waiting for unsuspecting prey to swim by. When threatened it will dash under the rock or go down inside the coral head it is sitting on for protection. This species of Hawkfish lives a solitary life and can be aggressive towards most other fish, especially those of its own species. Thinking about adding a Hawkfish to your tank? See the Saltwater Aquarium Fish Compatibility Chart first. The Arc-Eye Hawkfish likes to sit on the bottom, perching itself on top of a coral head where it waits for unsuspecting prey. When threatened it will go down inside the coral head for protection. Usually anything it can fit into its mouth, it will eat, and therefore is best kept with other fish in size that are bigger than its mouth. Don't be fooled, this little fish can open its mouth much wider than you may think! For more information, see the Arc-Eye Hawkfish Profile. The Flame Hawk gets along fairly well with other fishes, but may act aggressively towards other bottom-dwelling species. In a small aquarium this may present a problem, so either avoid other bottom-dwellers, or provide this fish with plenty of room and hiding places to ease territorial conflicts. See the Flame Hawkfish Profile for more information. While the Longnose Hawkfish is a great mini aquarium candidate, it will occasionally eat ornamental shrimps and may attack other fish with elongated bodies like Firefish and Dart Gobies. It will also eat just about any other fish that will fit in its mouth. The Falco's Hawkfish is a great choice for beginners. It should not be kept with smaller, less aggressive fish. It will spend most of its time sitting on the substrate, rather than on the rock and decorations in a tank. The Flame Hawk's vibrant red color, personable nature, and small size makes it a highly sought after specimen by aquarists. However, like most Hawkfishes, it is predatory bottom-dweller. It likes to sit on top of rocks or corals to keep watch, ready to pounce on any unsuspecting prey that swims too close. Keoki Stender's picture of an Arceye Hawkfish (Paracirrhites arcatus), taken off Waikiki, Oahu. The Arceye Hawkfish is very common perched upon coral heads at scuba depths. The coloration is variable but the ring behind eye is always present. It is found in Hawaii & the Indo-Pacific area. The Dwarf (Falco) Hawkfish (Cirrhitichthys falco) is common in the base of coral heads at scuba depths. It's cheek has two red bars and attains a length of 3 inches or less. It can be found in the Maldives to Japan and Samoa. The Freckled, Blackside or Forster's Hawkfish (Paracirrhites forsteri) is common on large coral heads in shallow water. It has numerous dark freckles on head. The juveniles are striped with yellow-green, or red-brown over white. Species outside Hawaii have a dark color phase with yellow peduncle. It attains a length of up to 9 inches. It can be found in Hawaii & the Indo-Pacific. The Freckled Hawkfish is a predatory bottom-dweller. It likes to perch on top of rocks or coral heads, just waiting for unsuspecting prey to swim by. When threatened it will dash under the rock or go down inside the coral head it is sitting on for protection. The Golden Hawkfish (Cirrhitichthys aureus) is uncommon at scuba depths on dropoffs. It attains a length of 5 inches and can be found in India, China, Japan, and Sulawesi. The Half-Spotted Hawkfish (Paracirrhites hemistictus) is an uncommon species along reef drop-offs. Two color morphs are seen but always have large black spots on rear half. It attains a length of up to inches and can be found in the eastern Indian Ocean & Tropical Pacific. The Longnose Hawkfish (Oxycirrhites typus) is an uncommon deep water species typically found with gorgonians and black coral. Ut attains a length of up to 5 inches and can be found in the Indo-Pacific, Hawaii, and Tropical Eastern Pacific. The Blood Red or Redbarred Hawkfish (Cirrhitops fasciatus) is common on reefs at scuba depths. It varies from bright red to greenish brown. It has a small angular spot on the gill covers and a diffuse blotch may be present on caudal peduncle. It attains a length of up to 5 inches and is restricted to Hawaii, Mauritius, and Madagascar. The Redspotted or Pixy Spotted Hawkfish (Cirrhitichthys oxycephalus) is uncommonly found in the base of coral heads at scuba depths. Its cheek has several spots and it attains a length of up to 3.5 inches. It id found in the Indo-Pacific & Tropical Eastern Pacific. 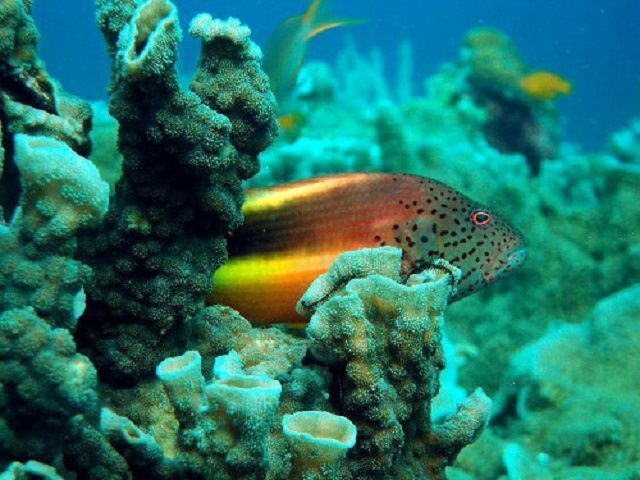 The Stocky Hawkfish (Cirrhitus pinnulatus) common on shallow reefs exposed to surge. It attains a length of up to 11 inches and is the only Hawaiian Hawkfish regularly captured for human consumption. It can be found in Hawaii & the Indo-Pacific. The Twospot Hawkfish (Amblycirrhitus bimacula) is a cryptic species usually hidden within small crevices or branching coral. It is a pale red-brown with black oval spot below the soft dorsal fin and on the gill cover. It is less than 3 inches in length and can be found in Hawaii & the Indo-Pacific.